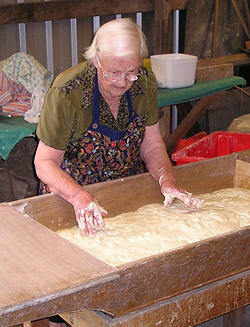 At over 90 years of age, Giuseppina Cusenza still made bread in her wood fired oven. It was a family tradition that she passed on to her seven children, who all now have their own wood fired ovens. Through their Italian upbringings, Maurelio Gabrielli and Robert Cusenza, the founders of Al Forno wood fired ovens have been involved in the wood oven business for over 30 years. Al Forno distributes and constructs quality Di Fiore wood ovens in Australia. In the mid-fifties, Ernesto Di Fiore, gifted with a particular creativity and manual ability as regards to reinforced concrete construction, invented and began to build his first prefabricated ovens. Built in his workshop in the basement of his house, the first ovens were sold to local families. Immediately they proved, compared to the old brick constructions, to be easy to assemble, economical, practical and above all baked bread, pizza and an infinite number of foods extremely well. In the mid-sixties the first pizzerias with wood-burning ovens appeared on the Adriatic Riviera and the Di Fiore firm built, also with the collaboration of the same pizza chefs, an oven especially designed for this particular use. The success of these ovens and the increasing number of requests to purchase them convinced Ernesto’s sons, Giorgio and Alessandro, to build a new factory in 1974 and start to mass-produce them. Based on the experience gained over the years, the Al Forno oven has evolved, firstly improving the quality of the refractory material used, then supplying the customer with a ready to use oven and lastly proposing a gas oven with an automatic temperature control. Today after 50 years and three generations, the Al Forno ovens are a synonym of quality and economy appreciated all over the world and contribute to the fame of the deliciousness and wholesomeness of the true Italian pizza cooked in a wood-burning oven. 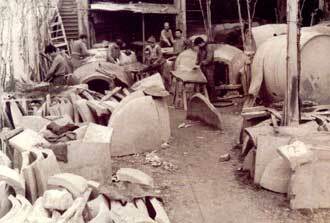 Lower Image: Di Fiore’s workshop. Cupra Marittima, in the 1950’s.